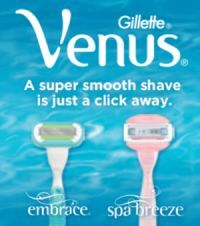 Costco members choose between one Venus Embrace handle with 5-blade razor cartridge or one Venus Spa Breeze handle with 3-blade razor cartridge and lathering shave gel bars. Click on "get sample" on the right side of the picture and it will take you to the sample order form. Click "Ok" on the popup to go to the order form page. Once on the order form page fill in your mailing address etc to get your sample.